I can’t believe… this ride happened in early summer… I’m still in June on my reporting while at the present time we are at the end of September here in Eugene and it has been raining for a few weeks already. I look at these pictures of sunny and warm days of early summer and I already start counting the days for the winter solstice: 93 days to go! And another set of days for Spring. 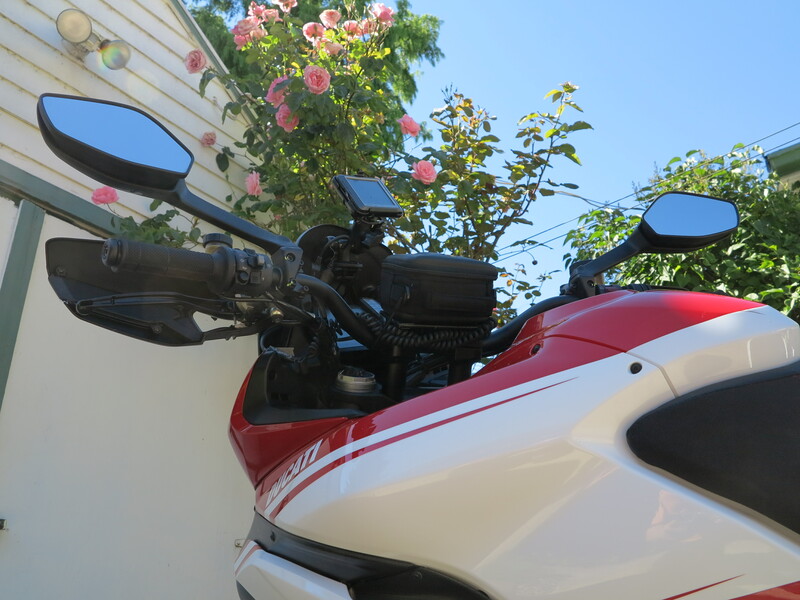 But back in the last days of June, I was just going out for another Sunday ride, blue skies and the promise of a very hot day. 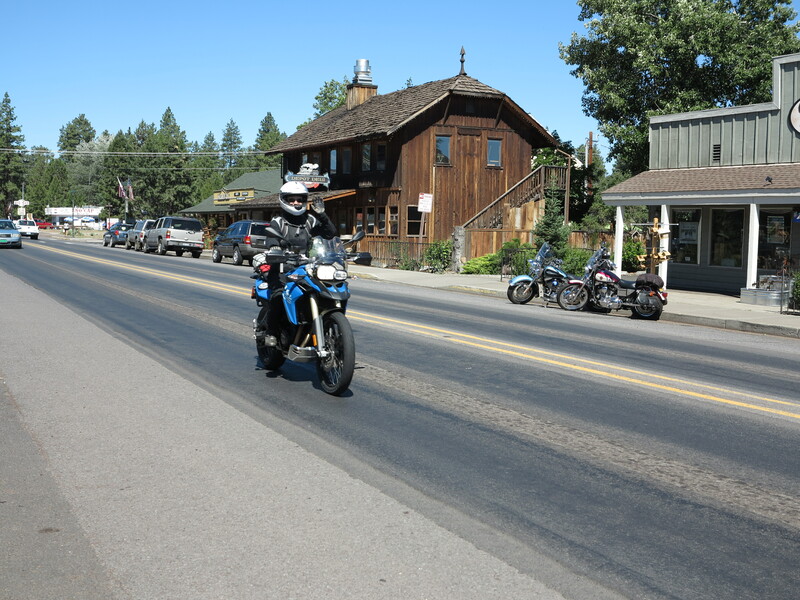 The local Ducati shop at the EMCWOR invited the local riders for a loop ride on the Cascades, going east on Hwy 126, then south on Cascade Lakes Highway, and returning via Hwy 58. 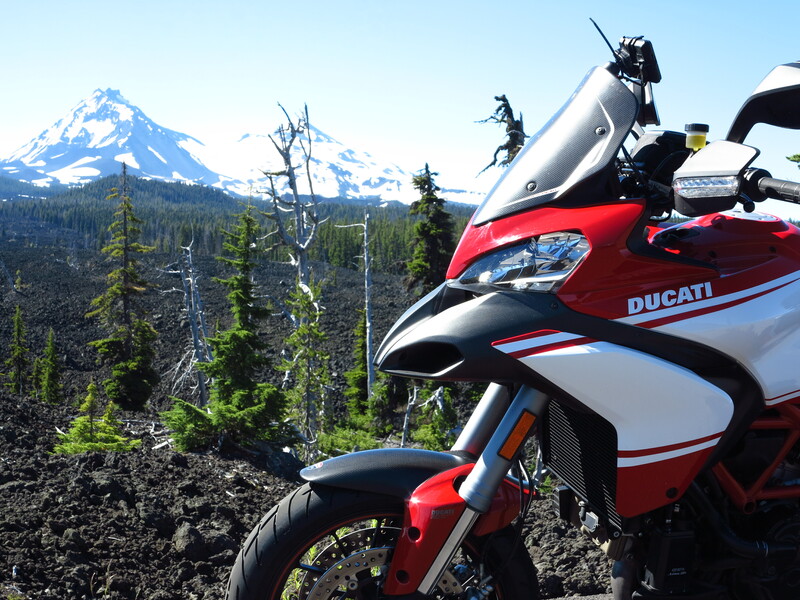 I had made such a trip just a few weeks back, when the Cascades Lake Highway had just opened for the season. Let’s go again. Some 20 riders or more showed up for the ride. While everyone followed 126 for a good measure, there were some new riders in the group, I took the Hwy 242 short cut. Check that light yellow color on the freshly changed clutch fluid. 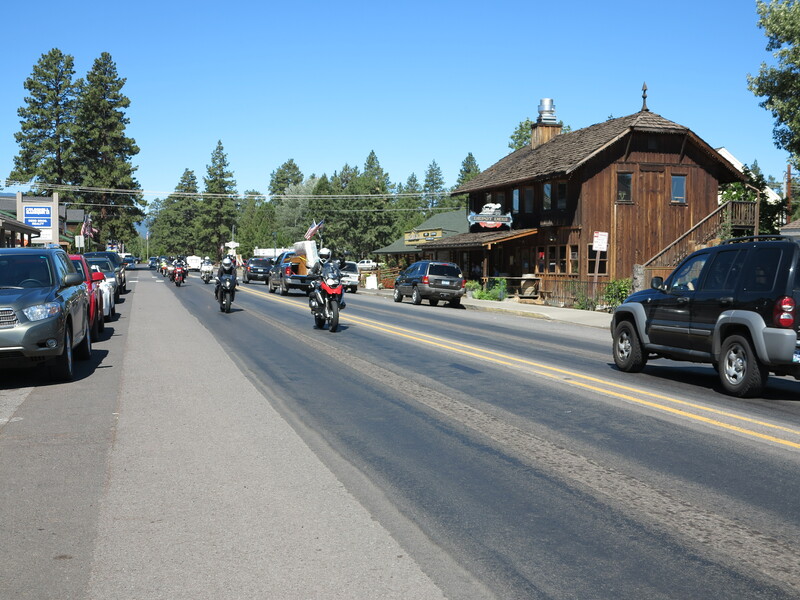 Hwy 242 has lots of gravel spread on top of the pavement, thrown from cars driving two wheels on the berm on some of this road’s many tight curves. Have to be careful here, so I appreciate the group of riders not taking this road, considering there were new riders in the group. I stopped for a few other photos, still on Hwy 242, after the McEnzie pass. 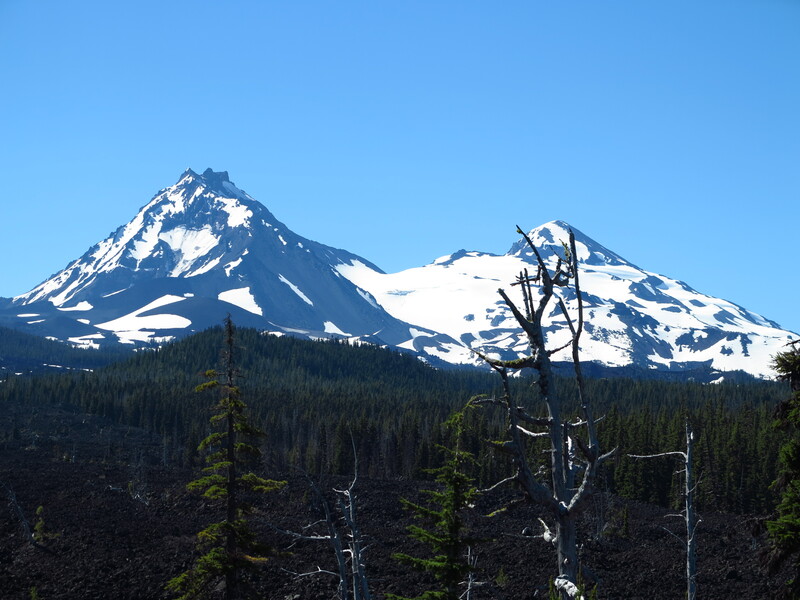 Here is a photo of Mt Washington and a lava field. Every now and then I try to imagine how this area formed, when these volcanoes emerged and then erupted the last time. Nature was very busy around here during those days. 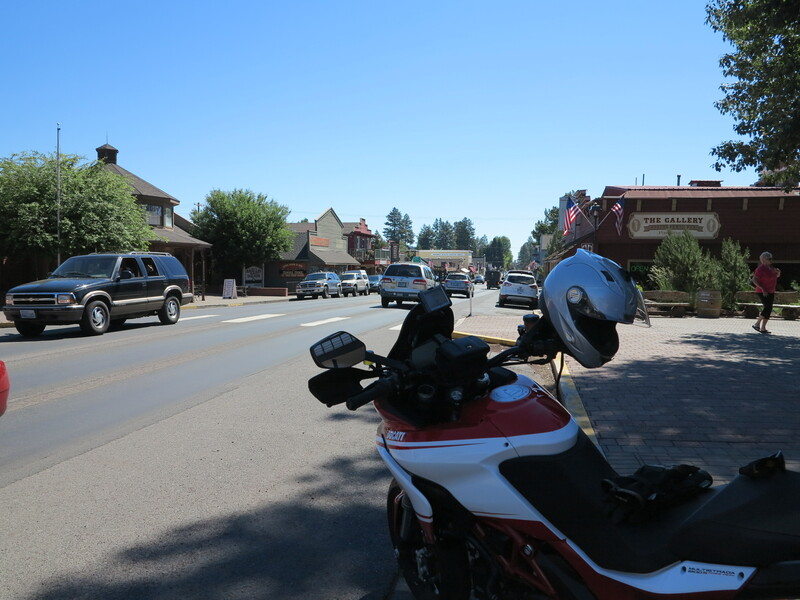 I arrived in Sisters, fueled the bike with non-ethanol gasoline. I parked in the shade, on the main street, and had to figure out the restaurant where we would be having a meal together. I was not sure whether the group of riders had already been through here or not. As I was about to get back on the bike and go, I spotted the group. They had stopped to check some water falls (along Hwy 20, I believe) that’s why they took some time to arrive. In normal circumstances, probably the time is very similar going the long way or on the more technical 242. But I stopped for photos and for gasoline, and they stopped for a view of water falls. I waited for them to go through, Scott was leading the group, Madelyn was sweeper. I jumped on my bike and caught up with them. 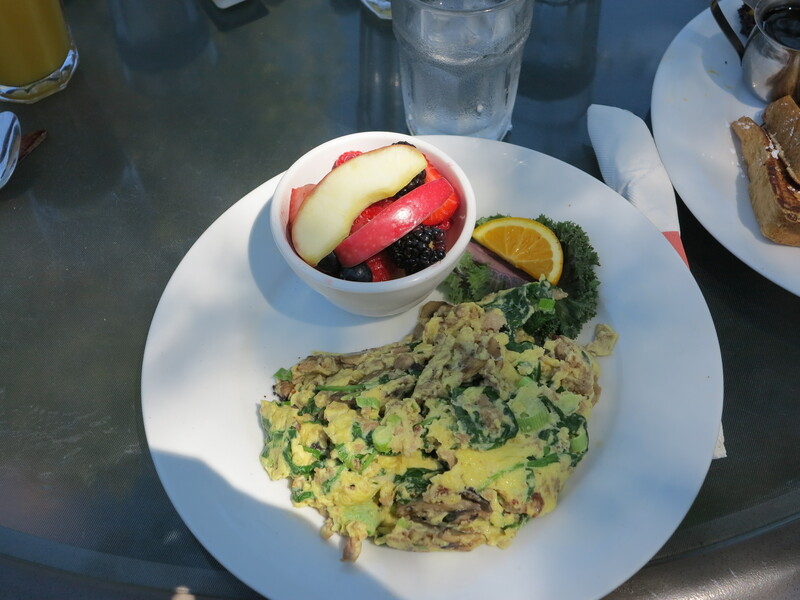 The restaurant was in the suburbs of Bend. I don’t remember the name of the restaurant, but the food I ordered was good. After the meal we got back on the bikes and continued towards the Cascades Highway. Riding with a group means you only stop where they stop. They did not stop at the places I wanted to photograph. 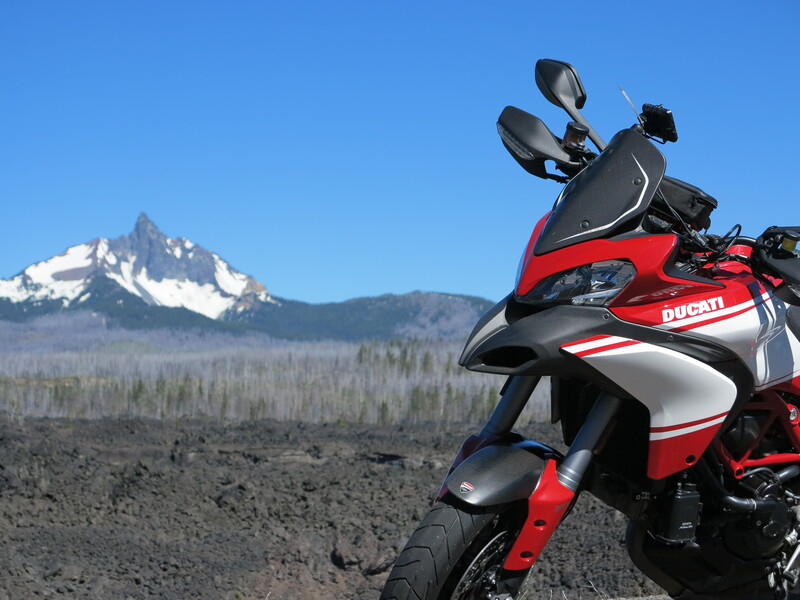 And anyway, the mountains were not looking as good as they were a few weeks ago when I rode through here. A lot of the snow had melted already. So from here on, we continued on Cascades Highway and the Hwy 58. It was just a straight ride home. I was riding sweeper and it was an uneventful ride. Made it home early enought to enjoy the rest of the Sunday relaxing. 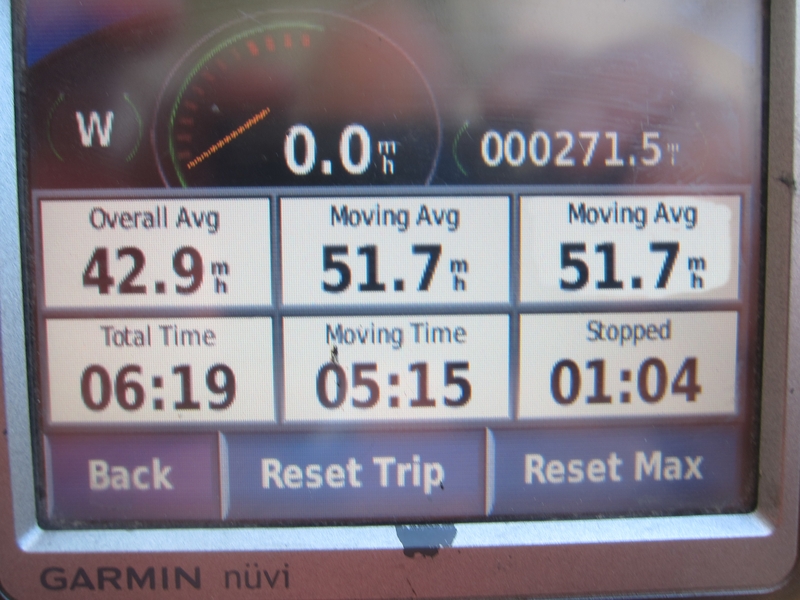 Total miles for this trip, 271 (436km). 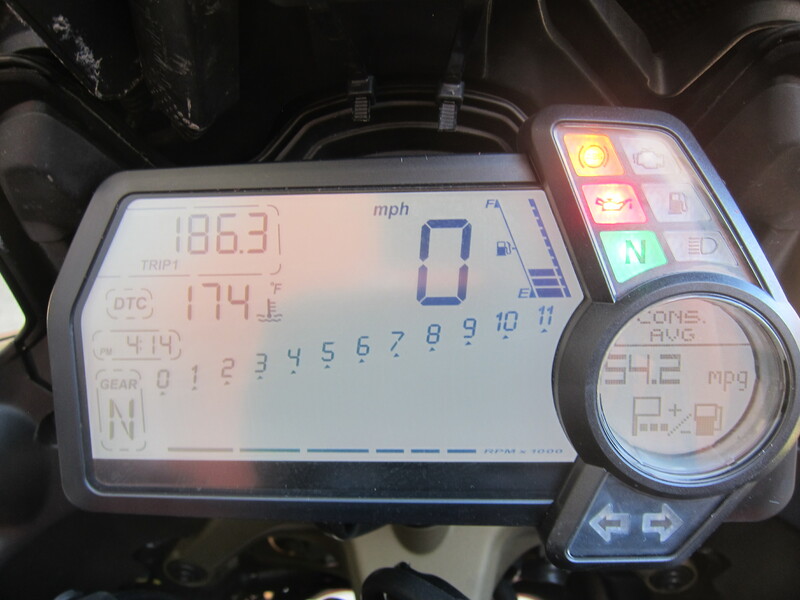 And I got my best (lowest) fuel consumption average on this bike up to that point. 54.2 mpg since last fill up, 186 miles ago in Sisters. Fueling the bike at the gas station in the high Sisters’ altitude, then riding 186 miles at sane speeds and coming down the mountain towards Eugene did the job. Anyway, this bike continues to impress me with its low fuel consumption. The changes made to this motor, with the dual spark plug, auxiliary air valve, and changed fuel injection angle has really made quite a difference, not only on the motor’s ridability, but also on fuel burning efficiency. 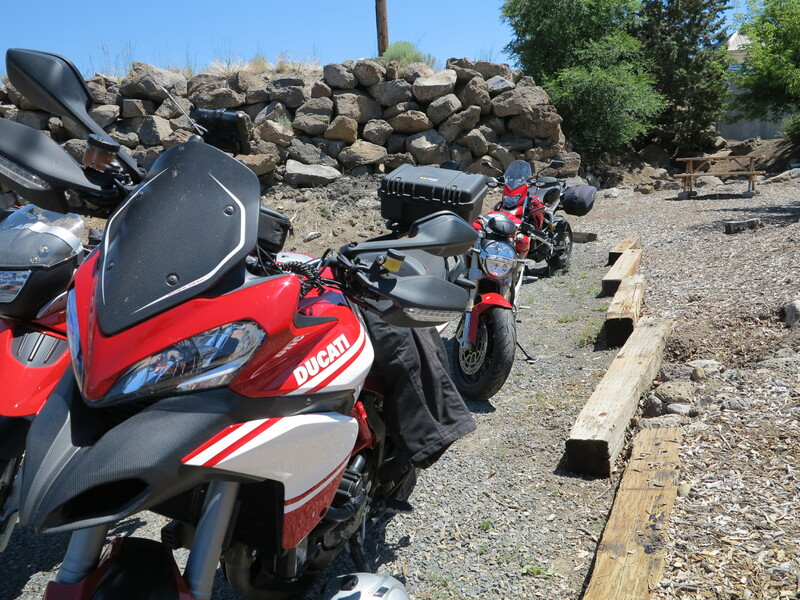 Next up is a trip to Portland via The Dalles at the Columbia Gorge. 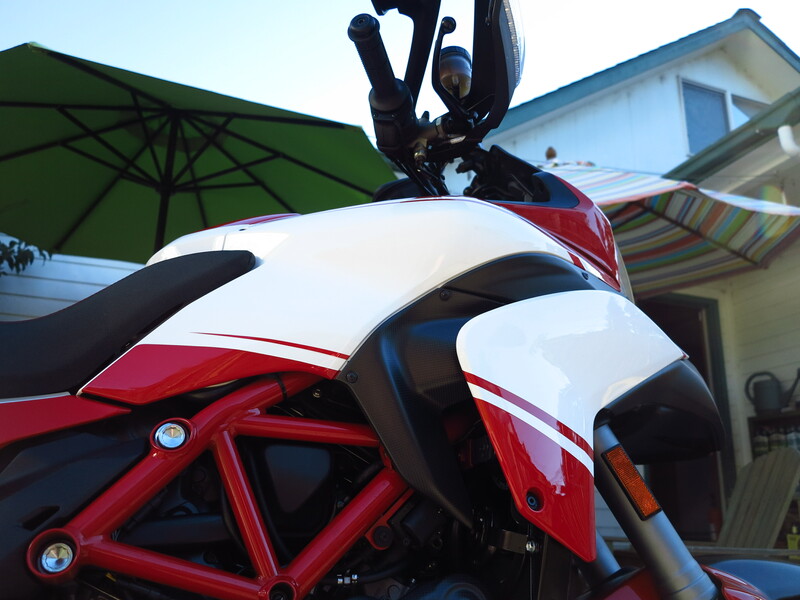 This entry was posted in Riding the Ducati and tagged 2013 multistrada pikes peak, Ducati. Bookmark the permalink.